It's OBG day for the DT at Bugaboo Stamps! On this day some of the Bugaboo DT shows off our creations featuring some of our favorite Bugaboo images that are not part of the current release. 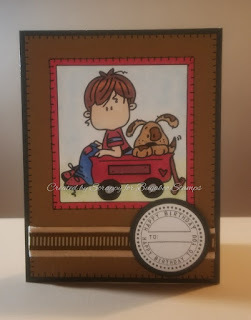 My card below features Bugaboo Brats - Seans Dog. Isn't he a cutie?! My sentiment comes from Stampin' Up. Let me know what you think in your comments, and then head over to the Bugaboo Stamps Store to check out THIS, and all of the fantastic stamps! How sweet! Thank you for joining our “Anything Goes” Challenge this week at Die Cuttin’ Divas. Fabulous card!! The image is so adorable!! Thank you for sharing your card with us at Lemon Shortbread Challenge Blog.